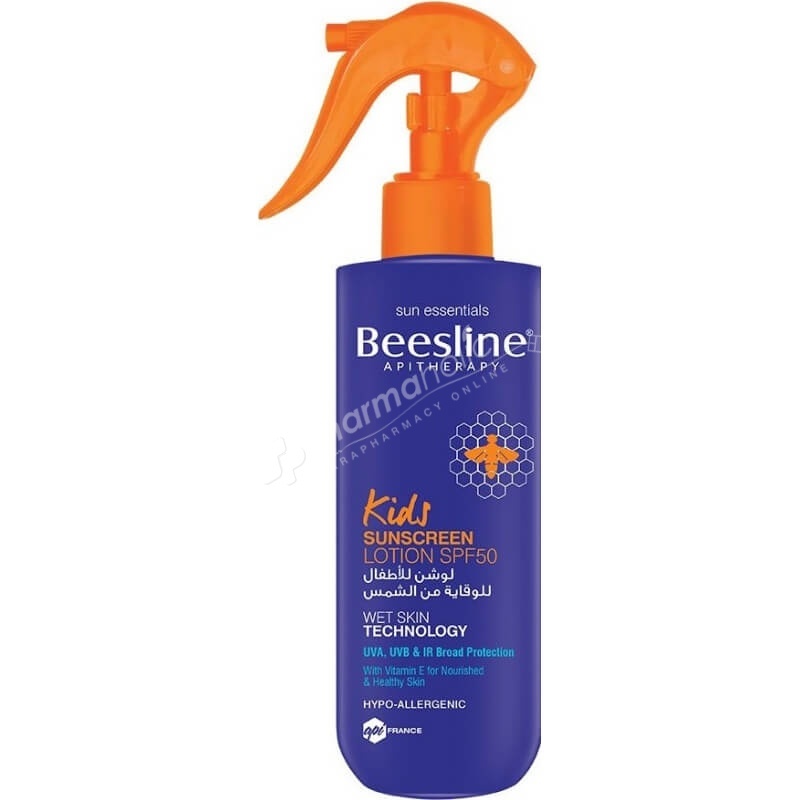 Beesline Kids Sunscreen Lotion SPF50+ is an easy-to-apply spray for kids with a wet skin technology & SPF50+ to provide a full-strength sun protection. Easy-to-apply spray formula that provides full-strength water-resistant sun protection while soothing & repairing the skin. Delivers 96% shielding from harmful UV rays & 80 mins of water resistance. Free from colourants, ethyl alcohol, oxybenzone, parabens, petrochemicals, phthalates and ingredients of animal origin (except bee by-products). TITANIUM DIOXIDE is a white mineral pigment used as a colourant in cosmetics. It can absorb the sun's ultraviolet radiation, and thereby, protect the skin from sunburn and other damaging effects of UV radiation. Due to its ability to absorb the broadest spectrum of ultraviolet radiation, titanium dioxide has been approved by the FDA for use in sunscreen lotion and creams. Apply generously to face & body 15 mins before sun exposure. Reapply every 2 hours & directly after swimming & towel-drying. Avoid staying in direct sunlight for prolonged periods of time. After bathing, apply Beesline After Sun Repairing Milk. Aqua. Octocrylene. Ethylhexyl Methoxycinnamate. Titanium Dioxide. Cetyl Alcohol. Potassium Cetyl Phosphate. Cera Alba (Beeswax). Stearic Acid. Vegetable Glycerin. Cocos Nucifera (Coconut) Oil. Xanthan Gum. Ceteareth-12. Glyceryl Stearate. Sodium Borate. Lawsonia Inermis (Henna) Leaf Extract. Ceteareth-20. Triticum Vulgare (Wheat) Germ Oil. Sesamum Indicum (Sesame) Oil. Citric Acid. Tocopheryl Acetate (Vitamin E). Potassium Sorbate. Sodium Benzoate. EDTA.